Welcome to the Bibliocycle Blog! We are using this first entry as a means of introducing ourselves to the public – we are a team of Boston Public Library staff that volunteer to ride around town, visiting farmers markets, outdoor events, indoor events, festivals, and any other event we are invited to! Do you have an event you want Bibliocycle to visit? 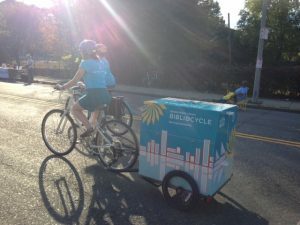 You can get more information about booking Bibliocycle for your events at: https://www.bpl.org/bibliocycle/request-a-bibliocycle-visit-to-your-organization/. You can also find out more information about Bibliocycle at: https://www.bpl.org/bibliocycle. Bibliocycle is a librarian-powered, sustainable, innovative outreach program. What is a Bibliocycle? We are glad you asked! Biblio means "relating to a book" and cycle is a shortened word for bicycle so when you see us pedaling by on the streets of Boston you'll know we are librarians pulling a book trailer by bicycle. Bibliocycle is a great opportunity for team members to expand outreach to communities that do not have access to brick and mortar BPL locations. It also gives Librarians an opportunity to get out into the communities and meet people in their daily lives. Bibliocycle is headed into its fifth season! Make sure to catch us out somewhere and sign up for a library card, check out a book, ask a reference question, and ogle the book trailer. We promise to have many interesting stories about our Bibliocycle adventures beginning in April!